Six Harlingen CISD schools were named to the 2017-2018 Educational Results Partnership Honor Roll for their high achievement and student success. 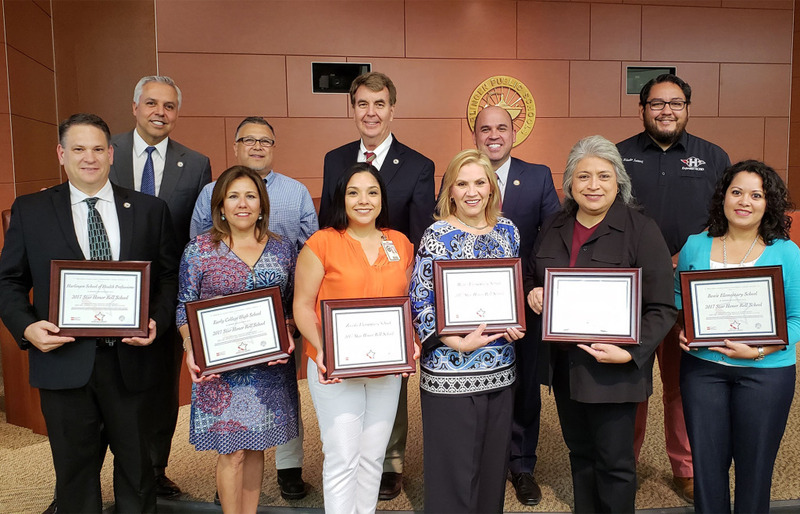 Receiving the honors were Bowie Elementary School, Dishman Elementary School, Early College High School, Harlingen School of Health Professions, Lee Means Elementary School, and Zavala Elementary School. The program, sponsored by the Institute for Productivity in Education (IPE), is part of a national effort to identify higher-performing schools and districts that are improving student outcomes. These HCISD schools are among 729 public schools in Texas to be recognized. The 2017-2018 Honor Roll is developed by Educational Results Partnership (ERP), a nonprofit organization that applies data science to help improve student outcomes and career readiness. Schools that receive the ERP Honor Roll distinction have demonstrated consistently high levels of student academic achievement, improvement in achievement levels over time, and a reduction in achievement gaps among student populations. For high schools, the ERP Honor Roll recognition also includes measures of college readiness.